12-foot snapper against the Oilers, set-up by Dillon Dube. 38-foot wrister against the Canucks, set-up by Kris Versteeg. 26-foot snapper against the Coyotes, set-up by Dougie Hamilton. 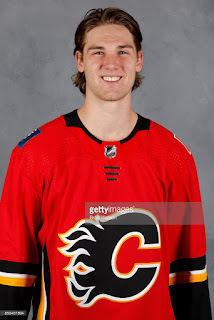 With three goals in three games -- each of them beautiful snipes -- Mark Jankowski is literally giving it his best shot when it comes to making the opening night line-up for the Calgary Flames. "There was a time where my shot was probably the biggest weakness in my game," says the 2012 first rounder. "But it's something I've worked on." A focus on improving his shot, to give himself a better shot, goes back to playing youth hockey. 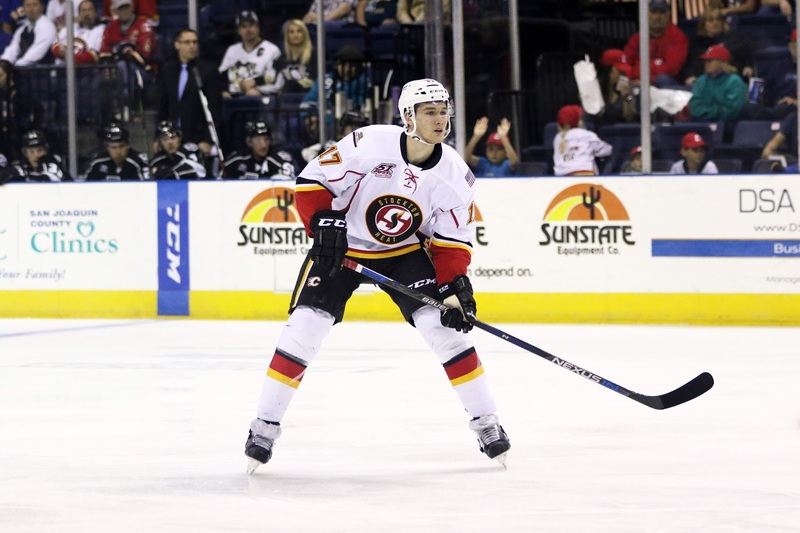 "I was a smaller kid growing up -- before I had my growth spurt -- so everyone was more physically developed than me, so they were bigger, faster, stronger and shot harder than me and that was a little bit frustrating," Jankowski recalls. "But I kept on working on my shot and eventually I grew and got some more muscle and it came along." A lot of shooting practice came in his parents basement at the family home in Dundas, Ontario. Seems Les Jankowski, a talented hockey player himself, who played four years at Cornell University, is a pretty decent rink maker too. "My Dad did a great job in our house," says the 23-year-old. "We had a pretty big basement so he set up a hockey area with boards and some sort of floor material that made it slippery. Me and my brother (David, three years younger) were always down there shooting pucks. We went through a couple of nets." From the Olympics to the Stanley Cup playoffs to the World Junior Championships, a lot of dramatic hockey moments were reenacted by the Jankowski brothers. "When we were little and we'd see a highlight on TV, we would go down into the basement and try to do that same thing," says Jankowski, with a smile. "When the World Juniors were going on, me and my brother would be world junior guys. The John Tavares year is the one that sticks out in my mind." That would be 2009 at the WJC held in Ottawa where Tavares had 15 points (8 goals, 7 assists) in six games as Canada ran the table to win their fifth straight gold medal. Jankowski was a formative 14 years old at the time. The fond Tavares memory further explains why Jankowski's third period face-off showdown with Tavares in Brooklyn last November was such a memorable moment. Even when his parents moved houses 5-6 years ago, building a spot for hockey was a priority. "That was the first order of business, getting a hockey area down in the new house," says Mark. "My Dad gets all the credit for that. He put a great area down there, and my brother and I, we use it a lot." Brandishing that much-improved shot, it's been an impressive two-and-a-half weeks for Jankowski, going back to the start of rookie camp. His performance has him as one of the leading candidates to grab one of the available jobs at forward. "I'm trying to get better every day and keep on showing the coaching staff and management what I can bring to this team," Jankowski says. "As camp goes on and it gets thinner and thinner, I just have to keep on doing that and when you get in some preseason games against almost-full NHL line-ups, that's when you can really show your stuff and show that you can play at this level and make an impact." A validation of where he sat on the pecking order as of Saturday morning came in the form of Jankowski being part of the first of two groups that hit the ice for practice. That group of 24 players -- 14 forwards, 8 defence, 2 goaltenders -- featured all the regulars and vets. "That's a good feeling to be out with those guys," he says. "I have to keep on improving and keep on showing well to stay with those guys. Obviously you want to be in that group and ultimately be in that locker room at the end of camp." Up front, the only other so-called 'bubble player' in that first group was Tanner Glass, in camp on a PTO. "I believe (Jankowski) can play at this level. Now, the next question becomes consistency and taking charge of it," says Flames coach Glen Gulutzan. "Now it's just keep pushing. It's an everyday league. He's got great skill. A couple things in the defensive zone, I think he needs to speed up in his coverage, but he definitely has the ability and he looks like an NHL player. As we go forward, you've got to keep building on that." While the imposing 6-foot-5, 210 pound centre has passed all the tests so far, the degree of difficulty when it comes to the calibre of the opposition is about to increase exponentially. Calgary has yet to face a team resembling a full NHL line-up, but with just three pre-season tilts left on the docket, that's about to change. "We're going to get into some better line-ups, more NHL-calibre players and it's going to ramp up," Gulutzan says. "The last two games, especially, are going to be at a different level and he's going to decide where he puts himself." Wherever he ends up to start October, bottom-six minutes in the NHL or top-line minutes in the AHL, Gulutzan says there are benefits to both. "You're not going to be wrong with where he's at, in my opinion," says the Flames coach. "In playing in the NHL for a year, you're not going to be wrong if you do a 40-40 or 30-40 split, but where you're going to be wrong, maybe, is if he didn't get any games in the NHL." Don't expect the latter to happen, this guy is simply too good. Veteran winger Kris Versteeg, who has spent time on the same line as Jankowski, says it's not a matter of if, but only when. "He's a guy that as the season goes on, you're going to see him get better and better," says Versteeg. "He's big, he's strong and rangy and once you gain confidence that you can do it at the AHL and then you gain confidence that you can do it in the NHL, once he starts to realize he can do it at the NHL too, it's only going to make him better. "There's even more untapped possible potential coming. Guys that big, it takes them longer sometimes to understand how good they can be." Versteeg agrees that the stiffer tests are still to come but he feels Jankowski has the hockey sense to succeed in the NHL. "Getting up to the NHL level, it's a faster game, there's a lot of thinking involved and if your brain can't catch up to what's going on out there, you're not going to make it," Versteeg says. "He seems like a kid that has that IQ and hopefully he can get up with the better competition, play with better players, and in turn that makes him a better player for himself." 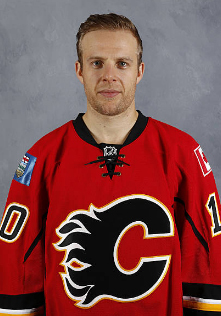 While confessing that he's not part of Flames management, you get the sense Versteeg would put him on the team. "He's looked really good the last three games and I've played with him," he says. "I sure hope he's ready because we could definitely use a guy like that to help push us forward." Jankowski realizes that dotting the scoresheet won't be enough alone, he's got to contribute in all facets. "Biggest thing for me is just trying to make an impact and get noticed out there and obviously scoring goals does that, but other little things as well like faceoffs and playing good in the D zone, stuff I've been really working on throughout this camp." From his unique vantage point of ice-level, Versteeg points to Jankowski's height and long stick, as one of his weapons. "Those plays in spaces where most guys probably couldn't get their stick on pucks, he seems to be able to with his reach. Even on that goal he scored. Long reach, he pokes it back. That's a play where if you're a shorter guy, maybe you can't get to it or it's a 50-50 puck. He makes it more of an 80-20 puck battle. Those little plays that he can make with his reach are small, subtle plays that open up ice for other players." With Calgary being his eighth NHL organization and with 600-plus big league games on his resume, the 31-year-old Versteeg has seen and played with a lot of different players over the years. So naturally, I had to ask him the comparison question. "Ya, there are guys that parts of his game reminds me of," Versteeg says. "Wayne Primeau, I played with him way back in the day. He's more of a checker but he was a big, rangy guy, long reach and hard to play against." The other name he offered up was done so with a bit of reluctance for obvious reasons, but again, the emphasis here is that it's part of his game that compares. "With maybe more talent the way he releases the puck and passes, obviously Joe Thornton is a hall of famer and you can't ever say a guy is like that, but just the way he can poke the puck with his reach, there are similarities," says Versteeg. "If he can fall somewhere in between that category, I think he'll be a pretty great player." No kidding that would make for a great find. Those two were both first round picks as well -- Primeau, 17th overall to Buffalo in 1994 and Thornton, 1st overall to Boston in 1997. Primeau, 6-foot-3, logged 774 games over 13 NHL seasons. Thornton, 6-foot-4, is on the verge of his 20th NHL season. He's played in 1,446 games. His confidence high, Jankowski can feel that he's close. "The more I play, the more confident I get and the more comfortable I feel," he says. He's gotten himself to this point. Now he just needs to keep up the momentum. "He's here now because he deserves to be here. He will dictate where he ends up," Gulutzan says. Along the way, Jankowski will continue to keep his ears open, keep listening and sponging up advice. While he may have graduated from Providence College a year-and-a-half ago, he's still very much a student. "When you're young and you're coming into a NHL locker room, it's almost surreal," explains Versteeg. "You see guys you've been watching on TV or guys you've been watching play for a long time. There's a processing phase you have to go through where you realize they're not just my superiors any more, they're guys that are on my level and I've got to believe that. "He seems really receptive to a lot of things. When we're on the bench, I played with him last game, and we talked about it. We talked about what plays can make us better and what things can help us and he gives you feedback. It shows that he's thinking the game just like you are too and it will not only help your game but it will help his too." Viewed for many years as a long shot to ever make the NHL, it seems hard to believe that he could be in Calgary's line-up when the Flames take on the Oilers at Rogers Place to open the season in 10 days time. Finally, five years after he was drafted 21st overall. What a terrific story that would be. And at this point in camp, you have to expect it. He's given it his best shot and so far, he's nailed it. Jankowski should play on the wing with Versteeg and Bennett. Those three will have fun setting each other up all season! I disagree! He is the perfect specimen for a centre. Besides that, he has played centre all his career and has been groomed as a centre for the Flames. I would keep Bennett with Johnny and Ferly for rest of preseason. What I liked about Bennett playing with Gaudreau is that after JG got shoved down after the goal he scored on Friday, Bennett answered back, something Monahan never does. I like Monny, but I'm not prepared to say he's a 1C. Jankowski -- on paper -- looks good, but he was really out-played the last two games. Goals aside, he has some things to learn, which doesn't mean he shouldn't stick with Calgary, it means the Flames will need to ease him in, initially. The big question is; where to play him. In some ways he seems like the ideal fit to play with Backs/Frolik allowing TKachuk to play with Bennett but it seems clear they want him at center. Do you move Bennett to the wing to see Janko at center? Seemes the Flames want Bennett at center as well. Playing him on the so called 4th line would be fine if it does not include him being stuck with Brouwer. Based on what I have seen this preseason Brouwer remains disinterested and lacks any passion for the game.